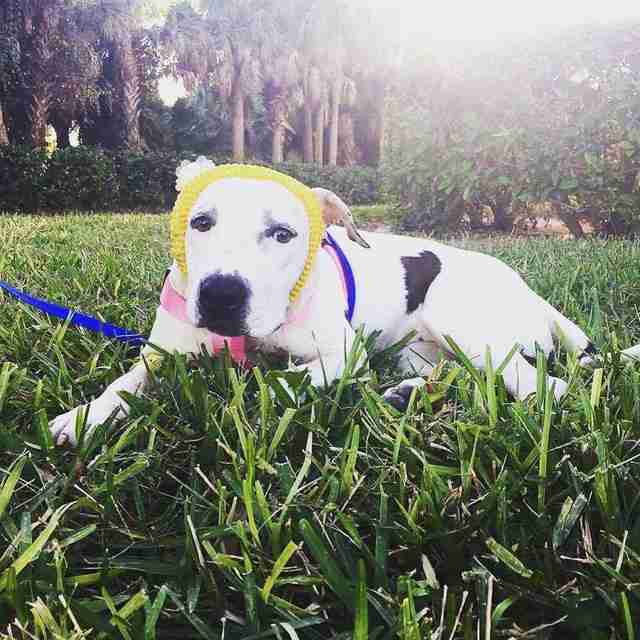 She lost her ear, but rescuers found the sweetest way to make her feel safe. Abigail was too gentle for the life she was forced to live. 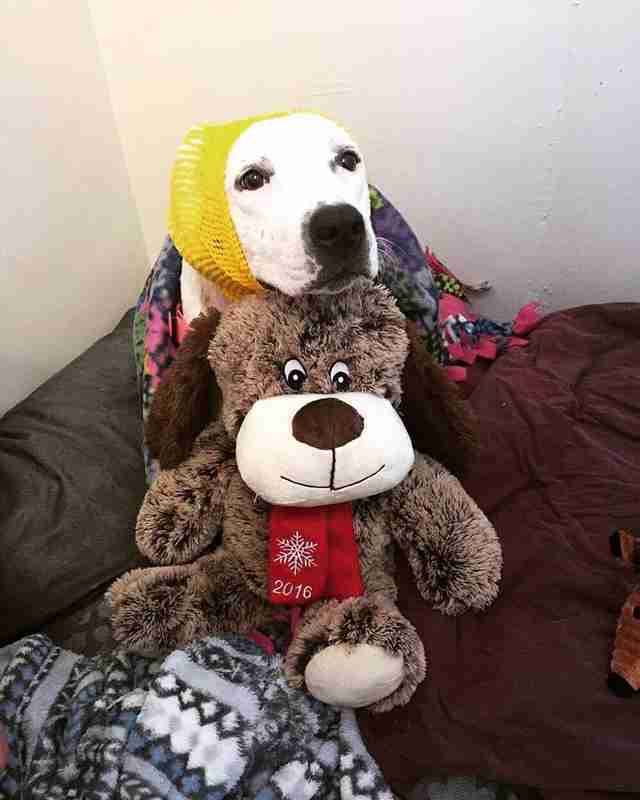 The 3-year-old pit bull mix was seized during a raid on a suspected fighting operation earlier this month. But she wasn't born to be a fighter. 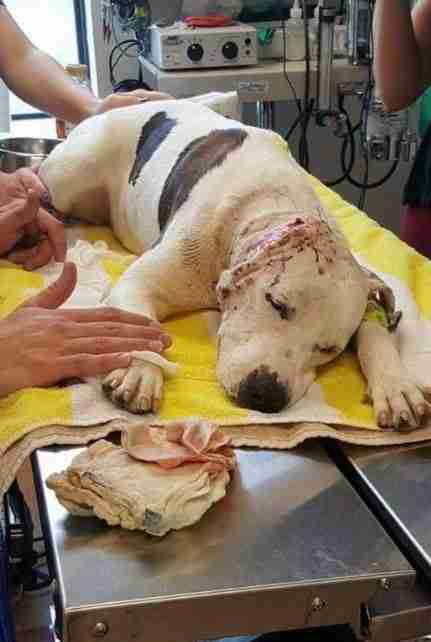 So her owner allegedly decided to use her as a bait dog, essentially a chew toy to work the other dogs into a frenzy. 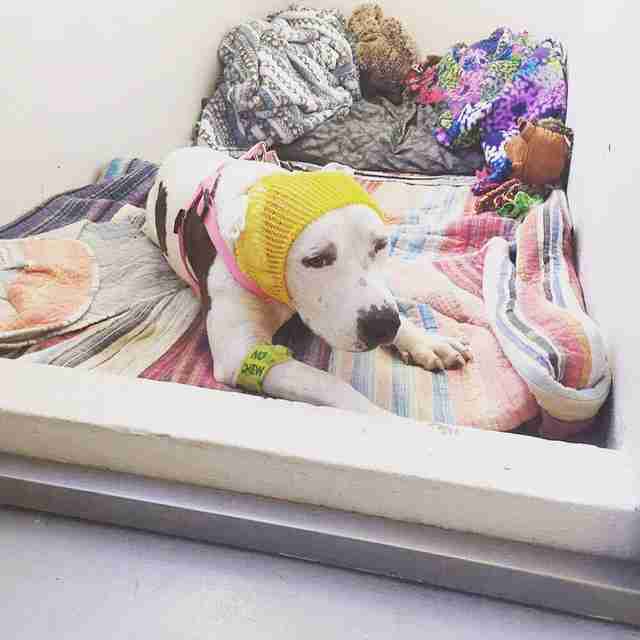 The dog arrived at Miami-Dade Animal Services in Florida broken in more ways than one. 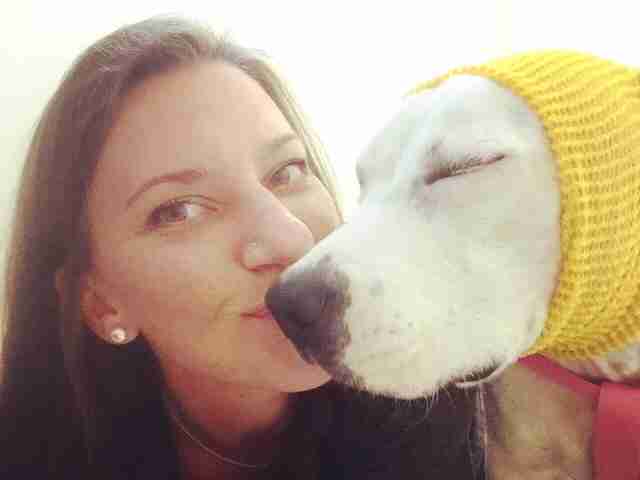 "She was anemic," Victoria Frazier, of Love is Fur Ever Dog Rescue, tells The Dodo. "She was infested with ticks. She smelled so bad." But most hauntingly, she was barely recognizable. "Her whole entire side of her face was missing," Frazier says. "Her skin tissue was hanging. Most of her ear was gone." Indeed, it had been ripped right down to the ear drum. When Frazier saw that face posted on Facebook earlier this month, she didn't hesitate. 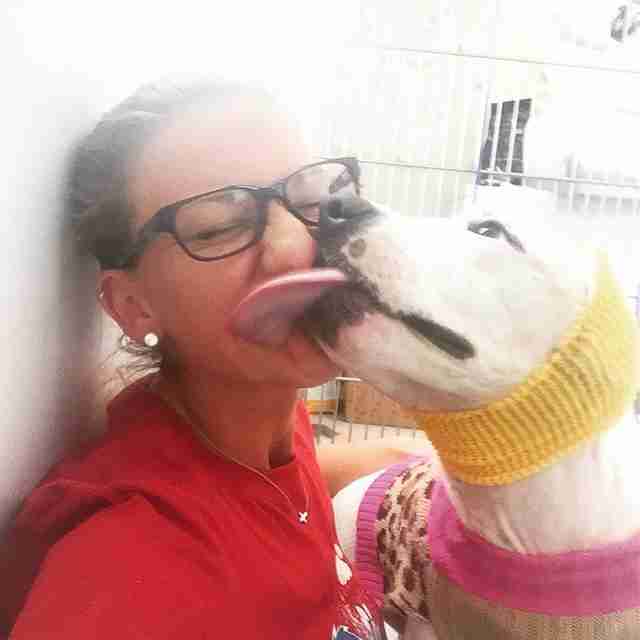 Abigail had only spent a day at the shelter before Frazier and her husband brought the dog to Pets First Wellness Center in Estero, Florida. The shelter's staff had given Abigail as much care as they could muster with limited resources. But it wasn't enough. "They do what they can," Frazier says. "But the pain meds and antibiotics she was on for the injuries that she had were going to do nothing for her." "Maybe another day or two and she probably would have passed from being septic," she says. "because her injuries were at least a week or two old." Abigail is only on her eighth day of treatment. The clinic has been posting daily updates on her condition to Facebook, as has Frazier on her own page. 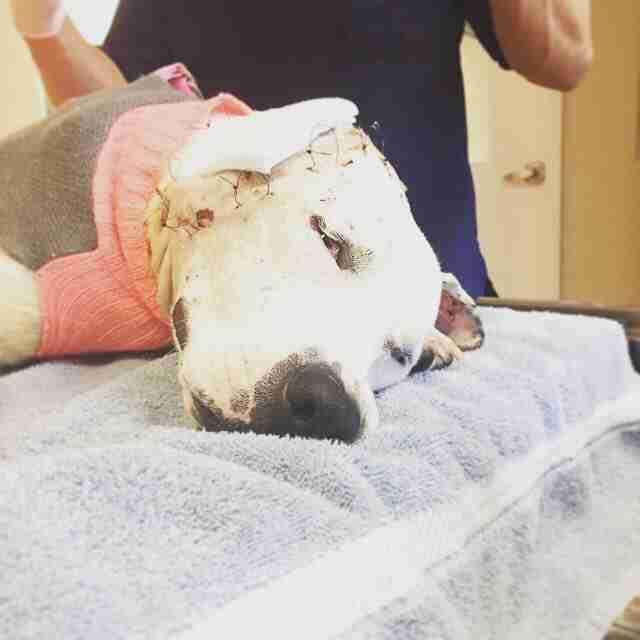 So far, her care has mostly involved bandage change after bandage change, costing around $200 to $300 per day. And Frazier's rescue organization has managed to raise enough funds to cover them for the next month. But Abigail has also gotten another kind of treatment. "We started it on day one with her little headbands," Frazier says. Eventually, she bought Abigail a collection of hats to wear. 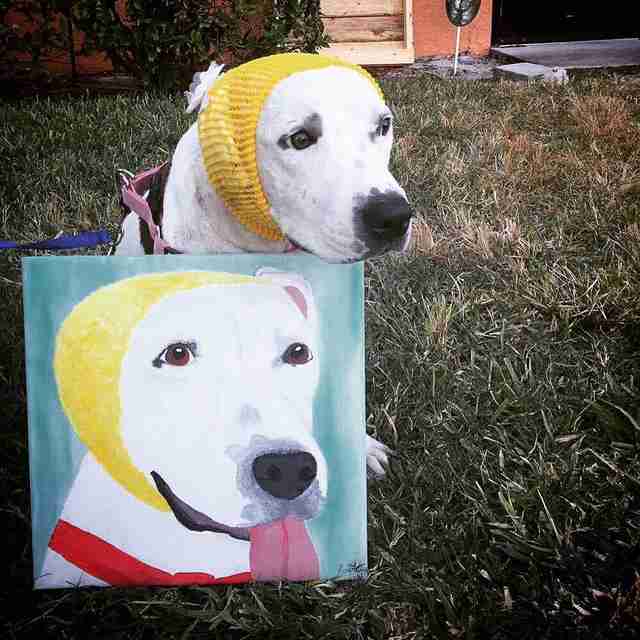 While they cover the dog's gaping wound, the hats also seem to bring out her sweet smile. 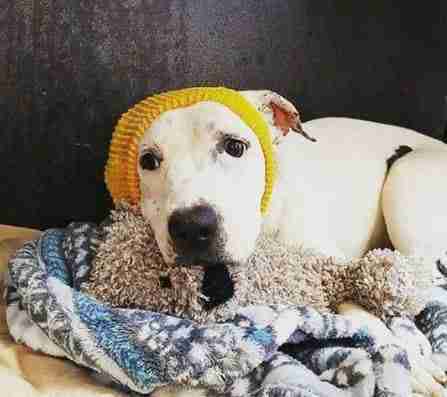 And the idea of bonnet therapy seems to have caught on with people who are cheering for this dog. "We actually have a couple of supporters who are hand-making some for her that are on their way," Frazier says. "She's going to wear those probably for the rest of her life," she adds. "We kind of made a little thing out of it." For now, Abigail is living at the clinic. Her first surgery is scheduled for Tuesday. But from there, she will go home with Frazier, who will be her foster mom until Abigail is strong enough for a long-term home. In the meantime, every day, little by little, her caregivers are catching glimpses of the dog she was always supposed to be. "She is a very happy girl," Frazier says. 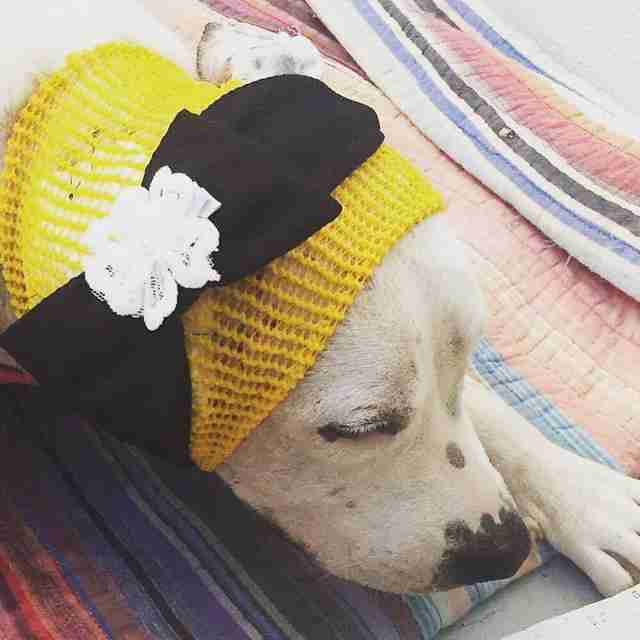 Want to help Abigail on her road to recovery - or even send her a hat to wear? Consider making a donation here.